The world was first introduced to Marius Beck on Season 1 of The Voice in winter/spring 2012. Marius’ blind audition in Episode 2 earned him a spot on Team Magne, and in the first battle round on March 16, performed ‘Bend and Break’ by Keane with Knut Anders Sorum. Marius went on to the live battle rounds on April 27, but he was eliminated in that round. On Sunday June 2, 2013 THE THIEF hotel held a special party and music showcase event to launch their rooftop bar, which is open for the summer months. Marius Beck and Tini – two of Magne’s talents from The Voice – and Canadian singer Lowell performed at the event, and Magne attended as well. WiMP Norway released EP of six live tracks from THE THIEF Roof Opening, including two songs each from the three performers, on October 4, 2013. 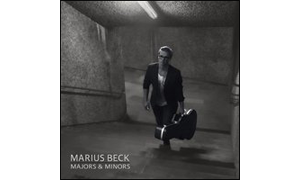 The ‘Majors & Minors’ EP was released via WiMP on December 6 and on iTunes on December 14.